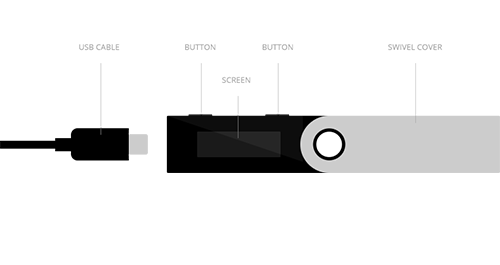 Plug your Nano S with the USB cable on a computer, and follow the instructions on the embedded small screen. You can choose to create a new wallet, or import a Bitcoin account or an Ethereum account. Whatever your selection, you just need to observe the on-screen instructions all along the process, selecting and validating with the two buttons above the display. Choose and memorize your four-digit PIN code that will be requested each time you connect your Nano S.
Confirm this PIN code and be careful to remember it: 3 wrong successive PIN codes will reset your Nano S.
Copy on the “Recovery sheet” supplied in the box the 24 words in order of appearance. This step is really important to guarantee you can recover anytime your wallet in case of loss or theft. You won’t be able to finish the configuration without confirming you copied the 24 words by selecting some of them as requested. Keep your “Recovery sheet” in a safe place. “Your device is now ready”, your Nano S is configured. Now you just have to install the Ledger Apps on your computer to use your wallet. In your Chrome or Chromium 50+ browser, download for free the Ledger Wallet Bitcoin Chrome app or the Ledger Wallet Ethereum Chrome app. You’ll find these management interfaces on the Apps page. This apps get installed in few seconds, and the upgrades are free. Now you can use your Nano S with your Chrome apps on any computer, even a compromised one, to send or receive payments. Each transaction will be verified on the embedded display, and validated with buttons.